Ogden on Politics: Why Can't the CIB's Lathrop and Okeson Tell the Truth About the Pacers? Why Can't the CIB's Lathrop and Okeson Tell the Truth About the Pacers? I know it's a crazy idea, but what if public officials, who were supposed to represent us, were honest with the public instead of using their positions to promote a particular agenda? I bring this up because of the supposed imminent Pacers' deal. The Capital Improvement Board, i.e. the City, is poised to give the billionaire Simon family millions of our tax dollars to subsidize their operation of Conseco Fieldhouse, a building which taxpayers built and the Pacers play rent free in. Right now the Pacers pay to run the place but get 100% of the profits that result from events at the arena. The Simons want us to pay to run the place while they pocket money from events at the building. This proposal will cost taxpayers as much as $18 million per year. 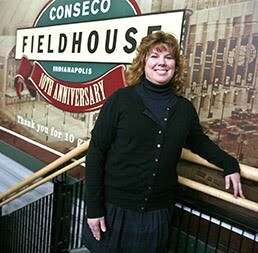 The CIB, led by Anne Lathrop and Paul Okeson, are negotiating with the Pacers. Throughout the process, Lathrop and Okeson have suggested to the public that the we can't afford to lose the Pacers and that we need to reach a solution on an additional annual subsidy for the team. In the face of a plethora of academic studies that all say professional sports subsidies are a horrible investment, Lathrop and Okeson went out to get a "homer" study by a company that promotes the hospitality industry which would give them the news they wanted to hear - we need the Pacers here! (The person who did the report was a former Goldsmith administration official who had originally worked on the Conseco Fieldhouse deal.) They could have gotten a study from an economist, but that person might have told them the truth about professional sports subsidies. Lathrop and Okeson weren't interested in the truth...they were interested in getting information that they could use to try to dupe the public into accepting their planned taxpayer giveaway. Of course, even getting to the point of considering the impact of the Pacers leaving is premature. The fact is the Pacers' contract doesn't let the Simons just pick up and move the team after ten years. Under the contract, the Simons have to be selling the team and the team moving out of state before the Early Termination provision can even be exercised at all. This is something that Lathrop and Okeson simply ignore. And why aren't Lathrop and Okeson telling the public the truth - that even if the Pacers exercised this Early Termination provision, the team's penalties would be enormous - $142 million in 2010. According to my sources, when that issue has come up CIB officials have suggested the penalties aren't that severe as the Pacers are entitled to a set-off for operating losses that would virtually wipe the penalty. The claim is a lie. The contract does not have a set-off for the penalty. What is it about Lathrop and Okeson that they feel no duty to be honest with the public? It is obvious that they do not represent the public's best interests. They are in their position to help the Simons out and by golly if accomplishing that requires them to lie to the public, they'll do it. While public officials lying is not exactly a new phenomenon, what has often held those folks in check is the few dedicated public servants who are willing to do their job and ask questions. But has any member of the CIB or any city or county politician ever asked questions and demanded answers about why the CIB would consider giving more taxpayer money to the Pacers at all? Nope. I have a better idea. Why don't we just get rid of these municipal corporations and their politically appointed boards and just have this be done by the council? That way, when the people get screwed over in a deal, we can at least vote them out of office. Seriously, how did municpal corporations basically become entities of their own that have the ability to take on dozens of millions of debt but not have a single elected person on the boards (besides the occaisonal council rep who also has a seat on a board)? That'd be an interesting experiment if you could run it - see if voters are more apt to reward a reasonably competent public official who was bluntly and completely honest or a slightly corrupt and/or incompetent who lied strategically and spoke in nothing but press release non-statements. Of course, Indy Student is right. Dishonesty appals me, and if I were on the Council or still on a Board, asking questions would come easy to ne. Were you on one before, Mary? MCB used to be county surveyor. My how fame is fleeting. Lathrop works for Crowe Horwath and has all kinds of conflicts of interest that she will not disclose to the public. She cut her teeth in Goldsmith's administration and learned how to operate like a snake in the grass there. Okeson's employer was bidding to take over operation of the CIB facilities with CB Richard Ellis. He's a self-dealer who should be called on the carpet by the media, but they all have their heads up the Simons asses and won't give the straight story to the public. Indy Student - the muni corps are also free to give several-hundred-thousand dollar salaries all while living off the public dole. Tax dollars spent on muni corps and through grants to organizations like IDI and ICVA, should have a salary limit like city hall does. Then, they'd have plenty more dollars to spend on getting debt paid off and doing the job they were created to do. The two boards to which Mayor Peterson appointed me and on which I served for a few years, were the Indy Greenways Development Commission and IMAGIS, Indianapolis, Mapping and Geographic and Infrastructure System. I was glad to help out. I did collect a salary for being Marion County Surveyor for four years, but not for serving on these two. Doug posted, before I wrote my first comment. I must say, his comment makes sense. Paul, you are so funny.